If you want to find a good stock to invest in, you need to know when it is about to enter into an uptrend. A stock that is about to make a new uptrend can also be very good for trading to the long side. But how do you know when a stock will enter into a Stage 2 uptrend? Here are some helpful hints. First of all, if you have never learnt about the 4 stock market stages, I highly recommend that you read the article that I have written The 4 Stock Market Stages Every Stock Will Go Through. In this article, I have laid down the basic foundation of how all markets, stocks, commodities, etf and anything that trades work through different cycles. 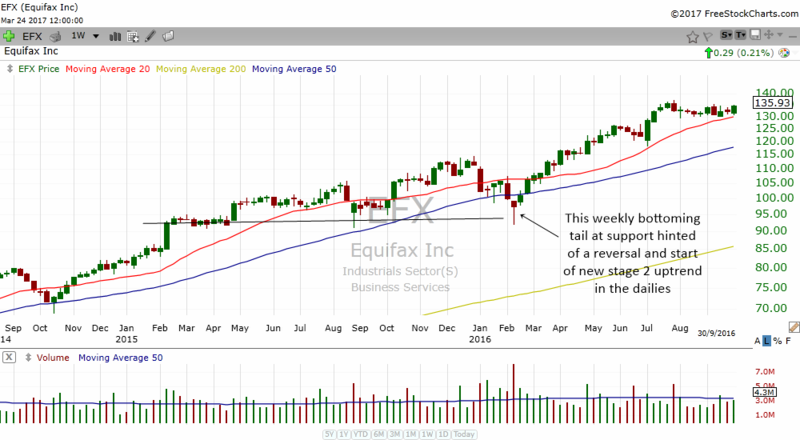 There are a few great ways to spot when a stock is about to enter into a stage 2 uptrend. Stage 1 is where the stock is trying to bottom and usually they might move sideways for a while. Some stage 1 are V shaped and some are rounded. Some may trade sideways. The important thing that you will notice is that the stock no longer moves down anymore. They do not make any lower lows but it stays within a range trying to find a bottom. 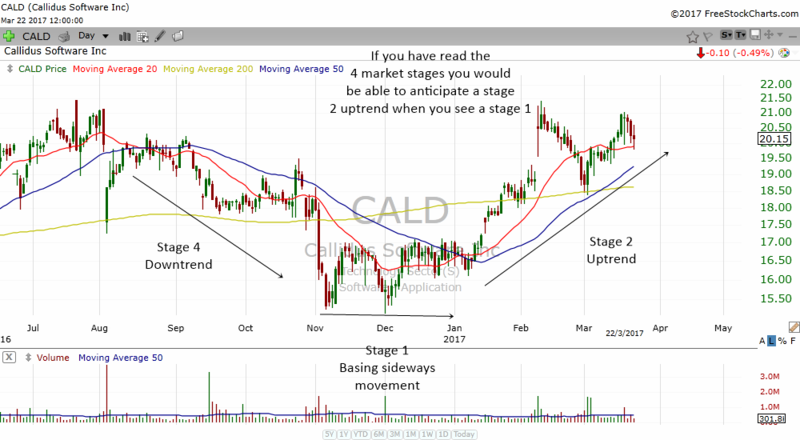 You can see in the chart above of CALD, the stock had a downtrend from August to December. Then you will notice that instead of moving lower, the stock forms a double bottom and does not go down anymore. It trades sideways for a while. To a technical analyst, he will suspect that a Stage 1 basing is probably forming in the stock. When you see a stock that behaves this way, you can anticipate that it is very likely that the stock will start a new stage 2 uptrend. However, you need other confirmations which I have listed below. Moving average crossovers are very good to help us spot trend changes. For example, I like to use the 20 day moving average and the 50 day moving average. When the faster MA cross above or below the slower MA, there is a buy or sell signal. In my case, I use it to help me spot trend changes. 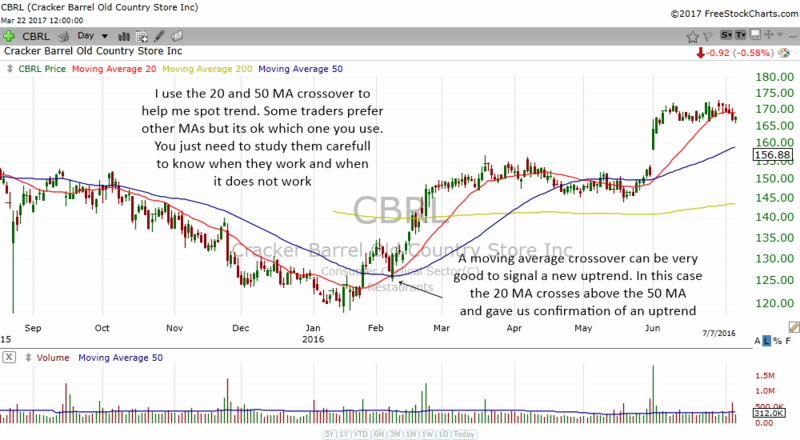 Take a look at the charts below and you will understand about the moving averages crossovers better. While moving averages crossovers are great to help us spot trend changes, sometimes they can produce many whipsaws especially when the stock is trading sideways. In my experience, the MA crossovers works best when the stock produces a more rounded bottom instead of a V shape bottom. Read about V Tops and Bottoms. A stock that breaks a downtrendline can often tell us that it is starting a new stage 2 uptrend. The longer term the trendline the more powerful the signal can be. Down trendlines are very simple tools that you can draw by connecting as many peaks as possible. When the stock breaks above the trendline that you draw, then it gives you more confidence that the stock may have a bull run from there. In the chart above, you can see how Apple broke a very long term downtrendline. 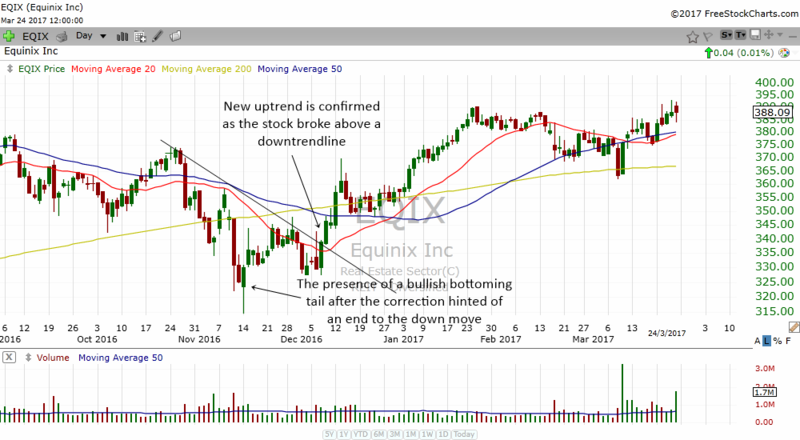 The stock broke above its weekly downtrendline and this gave the observant investor or trader an early hint that this stock is beginning a new weekly uptrend. I won't be showing all of them but take a look at the charts below and you will see how helpful they are to help you spot a new stage 2 uptrend. 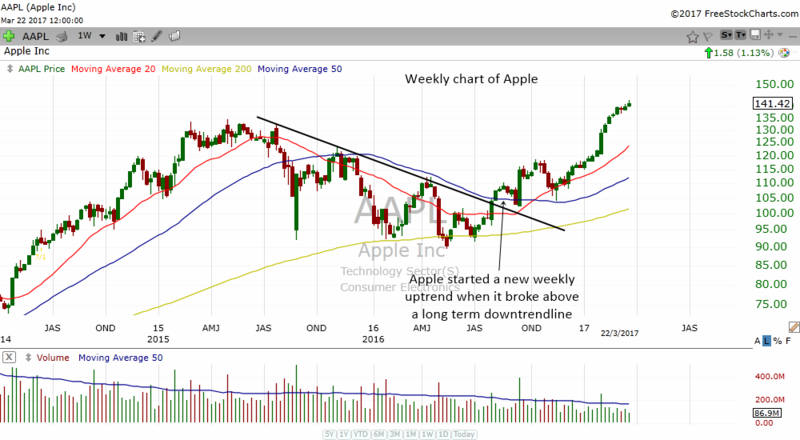 In the weekly chart of Apple above, you can see that Apple was forming a weekly triple bottom as it touches the weekly 200 MA support. 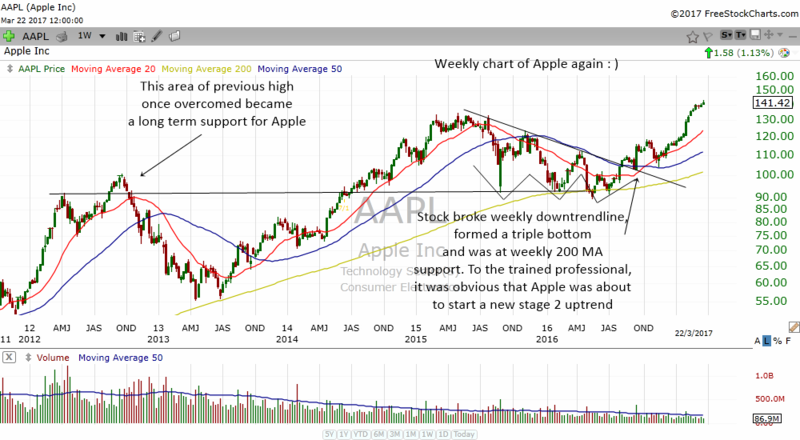 This triple bottom hinted to us that Apple is quite likely to start a weekly stage 2 uptrend. 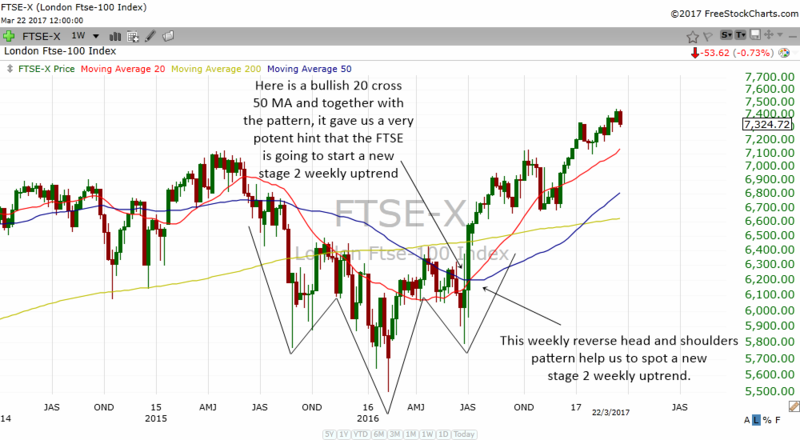 The chart of FTSE above shows us that FTSE was forming a weekly reverse head and shoulders. The pattern hinted to us that there might be a new weekly stage 2 uptrend in the index. The chart above again shows FTSE but in the daily chart. It was forming a double bottom which at the same time it was breaking above a downtrendline. 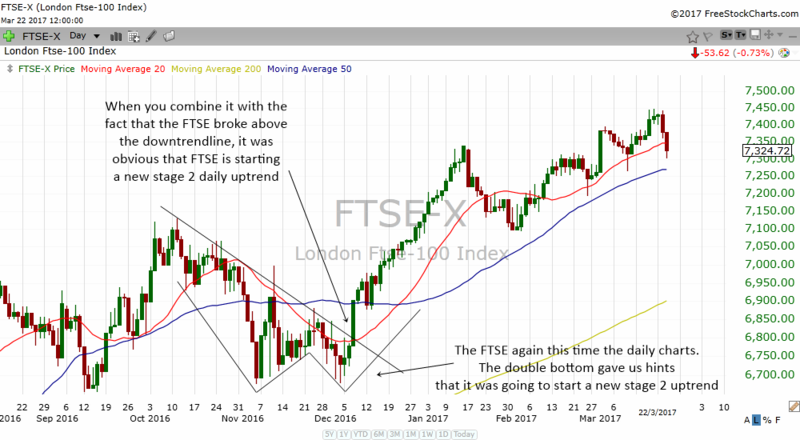 The powerful combination gave us a potent hint that FTSE was about to start a new stage 2 uptrend. 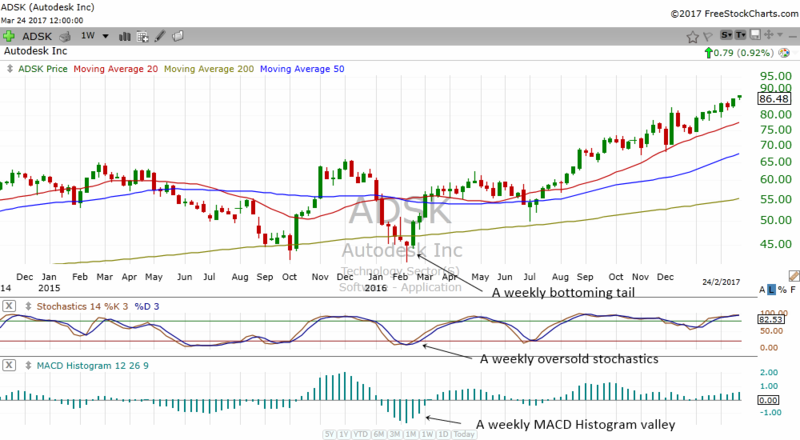 Long term support such as the weekly and monthly support are great areas to find a bottom for stocks that are in a downtrend in the daily charts. Many newbies fail to see why a stock that keeps dropping suddenly reverses direction. They fail to look at the big picture. They fail to look at the long term picture. In fact, if you make the weekly charts your friend, you are going to increase your odds of finding a reversal in the daily charts. You will begin to spot new uptrend in daily charts. 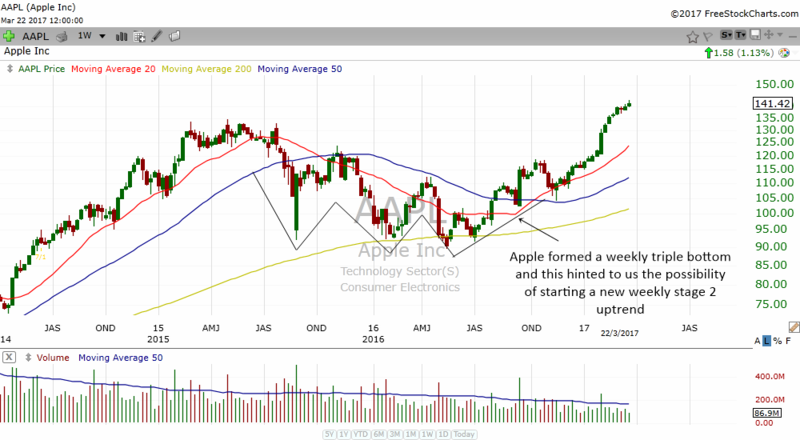 In the chart of Apple above, the stock formed a triple bottom in the weekly charts. At the same time, it broke above a downtrendline. Did you notice that the weekly triple bottom was formed near an old high? The old high once overcome became a long term weekly support that kept the stock from dropping. 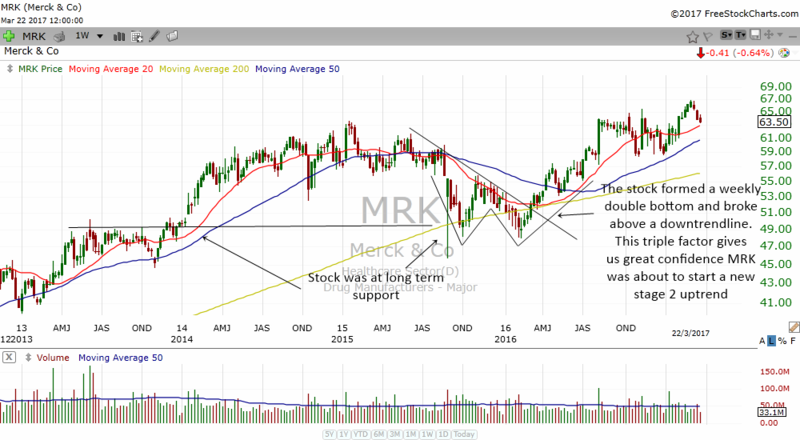 The chart above of MRK shows that this stock was forming a weekly double bottom at long term weekly support. Because the double bottom formed at the weekly support, the reversal chart pattern was very potent. As it broke a long term downtrendline, this gave traders a signal that it is starting a new stage 2 uptrend. By looking at the charts above, do you now see the importance of looking for long term support? That is why if you study and work off the daily charts, you need to look at one higher timeframe. Looking at weekly charts have brought me tremendous benefit and have enabled me to see a lot of things that I would not be able to see in the daily charts. One of the best ways to discover whether a stock is starting a new uptrend is to analyze its price behavior. A stock that is in a downtrend will make lower highs and lower lows. But when you see the stock cease to make a lower low and then start to make higher lows, this is a good indication that the downtrend is ending. When the stock starts to make higher highs and higher lows, it is a confirmation that a new stage 2 uptrend is beginning. 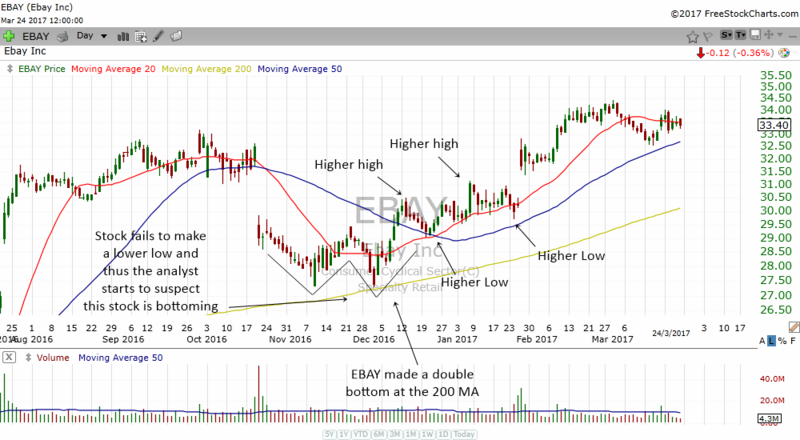 EBAY above was making a daily double bottom at the powerful 200 day moving average. The fact that the stock failed to make a lower low already gave us a hint that something might be happening to this stock on the long side. The stock then moved higher and started making higher highs and higher lows. 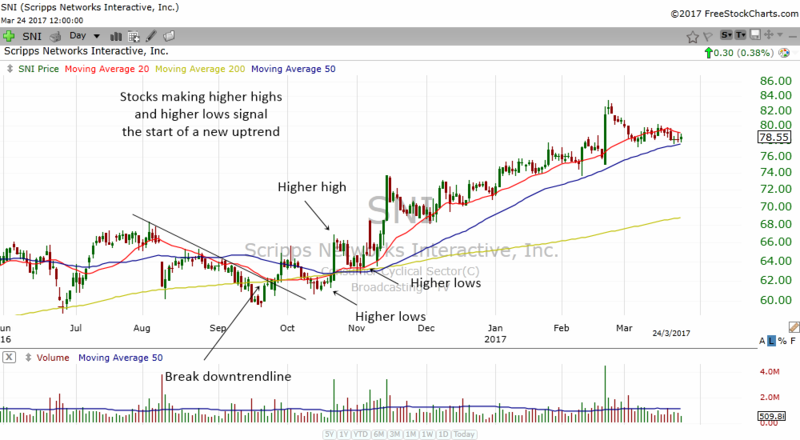 As the stock made a bullish 20 cross 50 MA, it signaled to us that this stocks is beginning a new daily stage 2 uptrend. 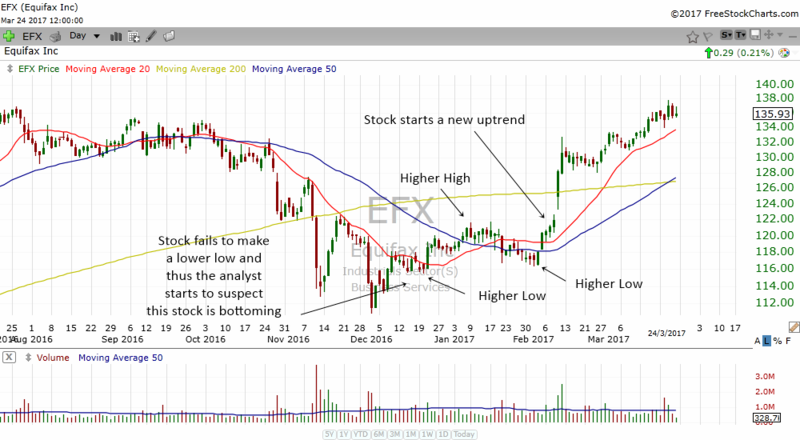 EFX had a downtrend from October to about December and the fall was quite sudden and fast. Even the 200 MA failed to keep this stock from dropping. Bit in late December, this stock made a higher low and by January and February, this stock started to make higher highs and higher lows which gave the technical analyst a hint that a new stage 2 uptrend is beginning. True enough, the stock started to climb higher. In the daily chart of SNI above, we can see that the stock started to make higher highs and higher lows. This told us that the stock is bottoming and the bulls are slowly creeping in and taking control of the stock. The stock eventually started a new uptrend and went higher. Bullish reversal candlestick patterns can often tell us in advance the end of a downtrend. However, in my observations, they have more value to spot the "V" shape type of bottoms. If you see a candlestick pattern like a bottoming tail appear after a quick crash, then it might signal a V shape recovery for the stock price. The signal is even more powerful if the candlestick pattern appear in the weekly charts. In the chart above, you can see how EFX setup a weekly bottoming tail at price support. The bottoming tail ended the V shape bottom and ignited a new stage 2 daily uptrend in the stock. The above chart is the daily chart of EQIX. It had a quick fall and then formed a green bullish candlestick bottoming tail. This gave traders a hint that a bottom may be happening in the stock. As it broke the downtrendline, it gave us more confirmation that this stock is definitely starting a new stage 2 uptrend. Technical indicators with the combination of other analysis can often point us to a bottoming in the stock. An oversold indicator in the weekly has powerful reversal signals when you combine it with other indicators and candlestick pattern. In the weekly chart of ADSK above, we can see the stock had a correction from Dec to February. The stock then formed a bottoming tail and at the same time it had an oversold stochastics and a weekly MACD Histogram valley. This all provided us with a great signal that the stock is forming a V shape bottom. The stock eventually rose and started a new uptrend in the weekly charts. Many chart patterns can be very useful to set target. For example, the measured move, the double top, triple top and head and shoulders top can often give us a projected downward target. 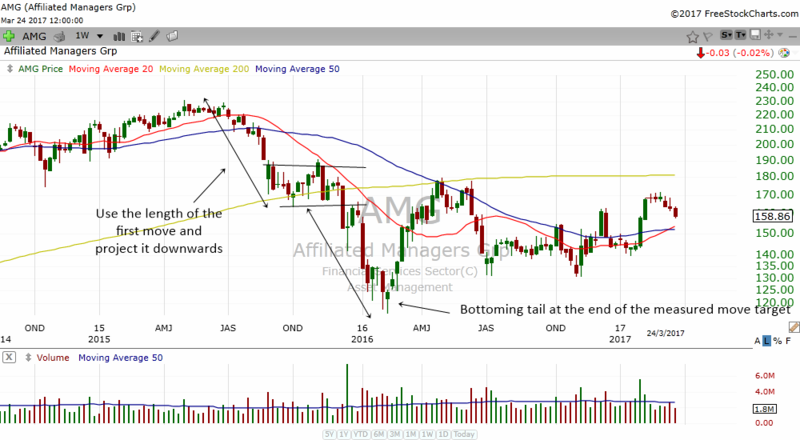 The chart above of AMG shows how a measured move can act as a target that give us a hint when a stock may bottom. AMG formed a weekly bottoming tail at the end of the measured move target and it started an uptrend in the daily charts. The combination of a bottoming pattern together with a measured move can often be very powerful combination. The weekly chart of APA above shows the stock forming a weekly double bottom at the end of the measured move. 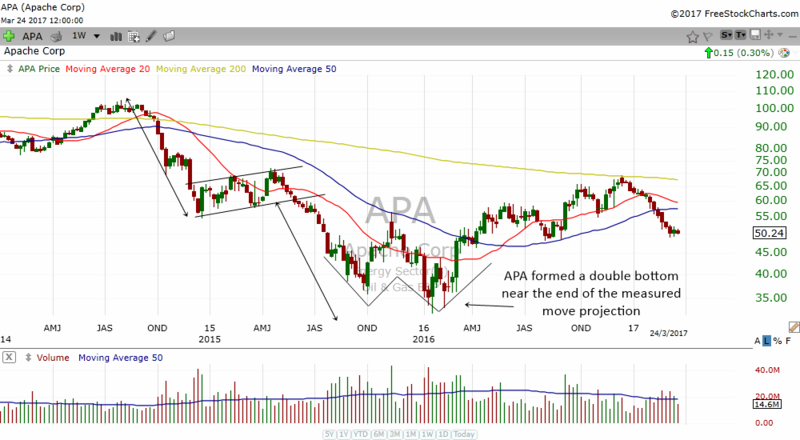 The pattern marked the end of the downtrend and help APA start a new uptrend. 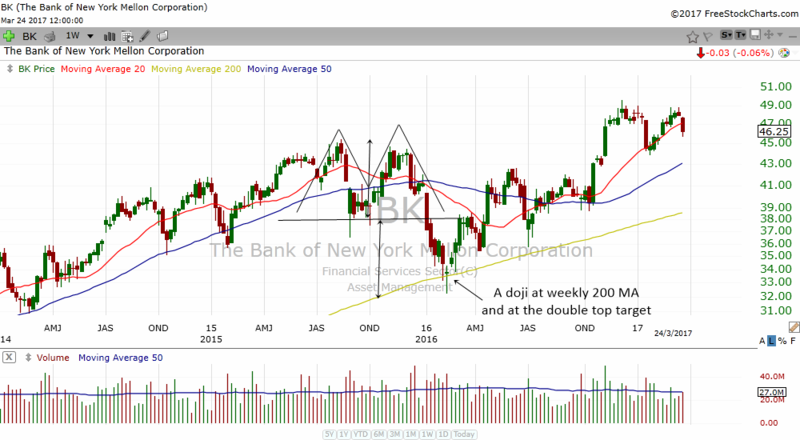 The weekly chart of BK above shows how a double top target can give us a hint when the stock will bottom. After a crash in the stock, it formed a weekly doji which just happens to be at the weekly 200 MA and the double top target. The stock bottomed and then started a new uptrend. 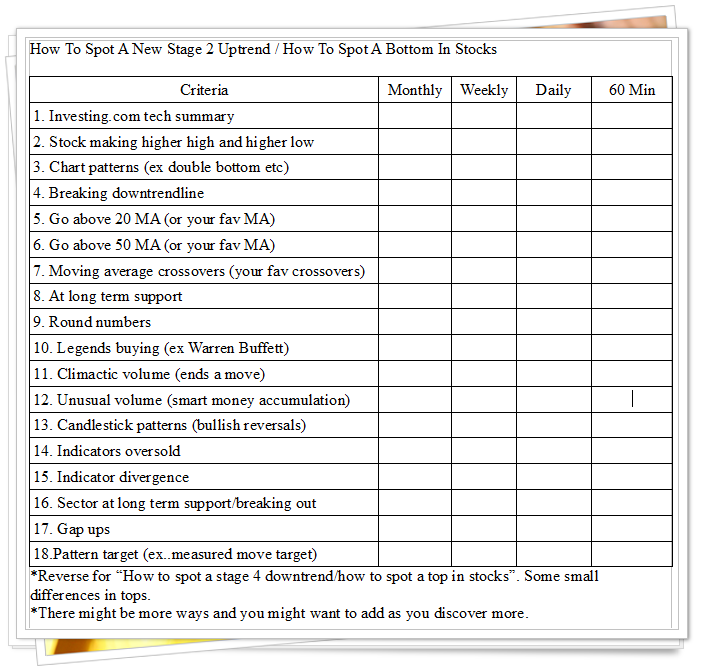 Below is a cheat sheet which I have created to help you spot a new stage 2 uptrend. As you look at stocks and how they bottom you will see many of the below criterias kick in. You might also discover more on your own and you can add to it.